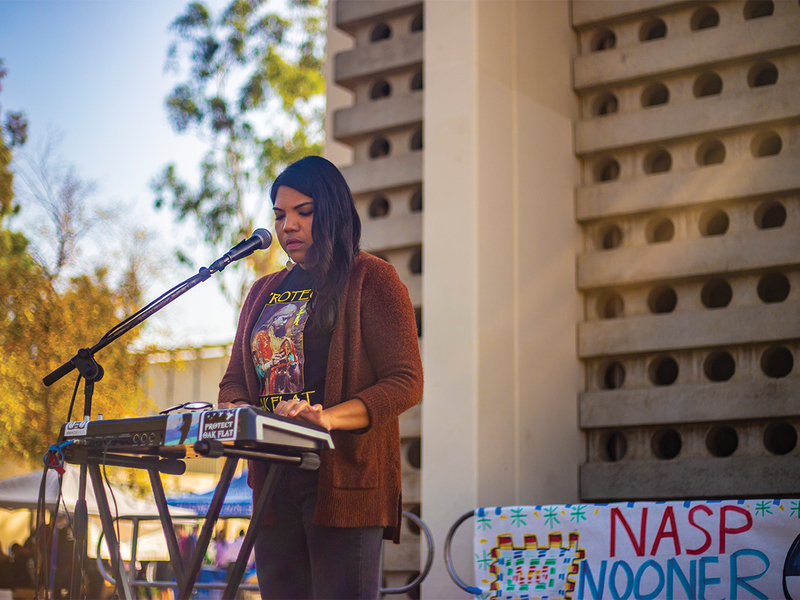 On Wednesday, Nov. 7 at 12:00 p.m. at the Bell Tower, the sound of analog keyboards and soulful vocals permeated the air as Sallee Free, the featured musician at the Native American Student Programs’ nooner, performed music inspired by her Native American culture. In honor of November being Native American Heritage Month, the Native American Student Programs (NASP) invited LA-based artist Salle Free, an indigenous performer who produces music surrounding issues faced by the indigenous community. With her unique “indigenous soul” style, she captivated students with singles like “Black Snake Killaz,” a song addressing the Dakota Access Pipeline and the protests at the Standing Rock Sioux Reservation. Free’s lyrics emphasise the resistance and destruction of native lands in the interest of corporations. Between songs, Sallee Free spoke about how incorporating world issues within music is essential to artistry, saying, “It’s important for music to have substance, and bringing substance into life is a necessity.” Music is a perfect way to convey political and social messages to a larger audience, which made her presence especially crucial to highlighting Native American Heritage Month. The “kick-off” for Native American Heritage Month, NASP’s nooner evoked positive sentiments among affiliated staff and students. 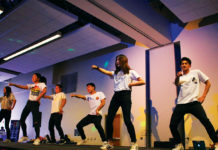 “It’s nice to have an indigenous woman performer to represent our culture,” LeeAna Espinoza-Salas, the chairwoman for the Native American Student Association (NASA), said. She added that historically, Native American women have been an extremely marginalized group, so having an indigenous woman starting off the NASP’s events for November was symbolic for both Native American women and all women of color alike. Throughout the nooner, students congregated around the Bell Tower, mesmerized by Sallee Free’s smooth vocals and unique instrumental backings. “Sallee Free is a talented and relevant native artist who establishes a sense of community for native peoples throughout the Americas. 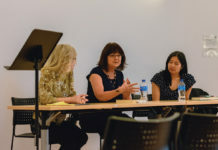 I’m glad that the nooners are not limited to only one group and are for all students,” reminisces Madison Garcia, the secretary for NASA and a second-year history major minoring in Native American studies. The casual and fun environment set by the nooner enabled the event to reach out to more than just students who identify with indigenous culture. Hosting a nooner to start off Native American Heritage Month, according to Sara Medel, the program coordinator for NASP, was vital to “expose the UCR community to native artists through an inclusive event that is open to all.” The event had a variety of students immersed in the music, and it served as a platform for Sallee Free to discuss tribal sovereignty and the need to respect nature. She made statements in regards to how society is destroying Earth’s resources and that people need to increase environmental conservation efforts. Upcoming events being held in recognition of Native American Heritage Month are open to the community. On Wednesday, Nov. 14 from 5:00-9:00 p.m. at the UCR Community Garden, students can join NASP at their “Native Jam Night” event, dedicated to arts and crafts as well as indigenous music performances. On Saturday, Nov. 17, NASP is hosting the “Spirit of the Tribes 5K,”a fundraiser for UCR student scholarships. 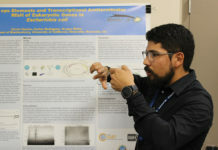 For more information on upcoming NASP events, go to their website at nasp.ucr.edu.